There is place we like to eat in Pai called Home. It’s a nice little restaurant that appears to be run by a woman and her teenage daughter. Her younger daughter is often there doing her homework, as is an older lady who may be the owner’s mother. They don’t speak much English, but the food is good and cheap, they have a travel Connect Four game for patrons to play, and there is one outdoor table surrounded by trees that is great to sit at if you can get it. Fried egg on what?!?! 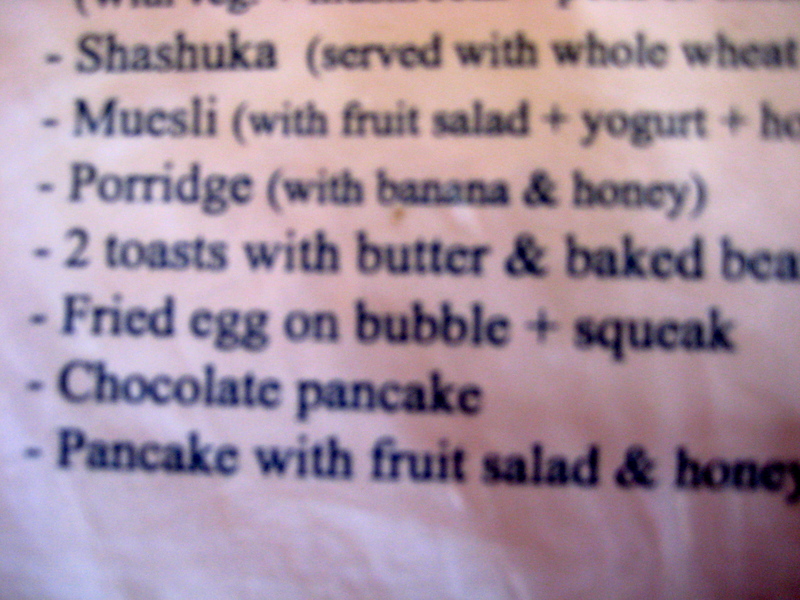 What the hell is bubble + squeak? When I ordered it, I thought the lady taking my order would clarify what it was when I asked for it, but she was all, “Bubble and squeak? Ok.” and walked away as if, well obviously, we all know what bubble and squeak is. 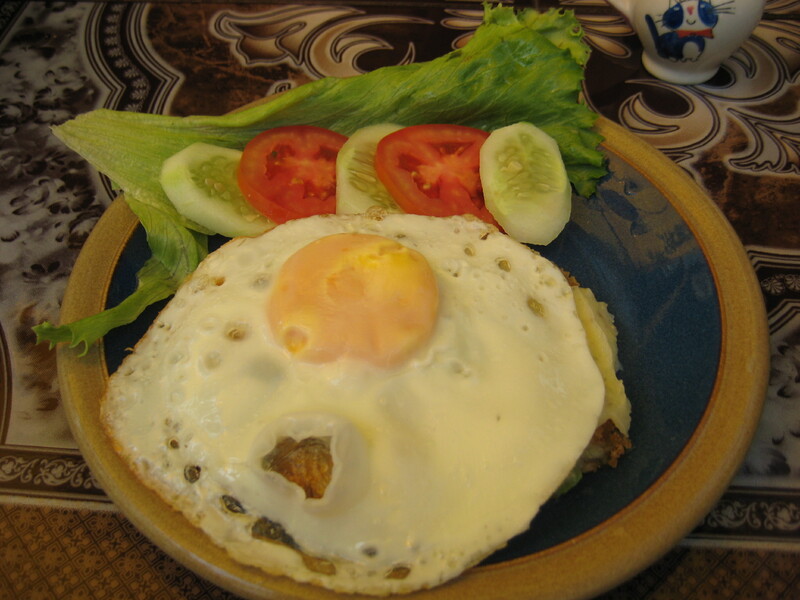 So that’s the fried egg. Nice touch with the veggies. 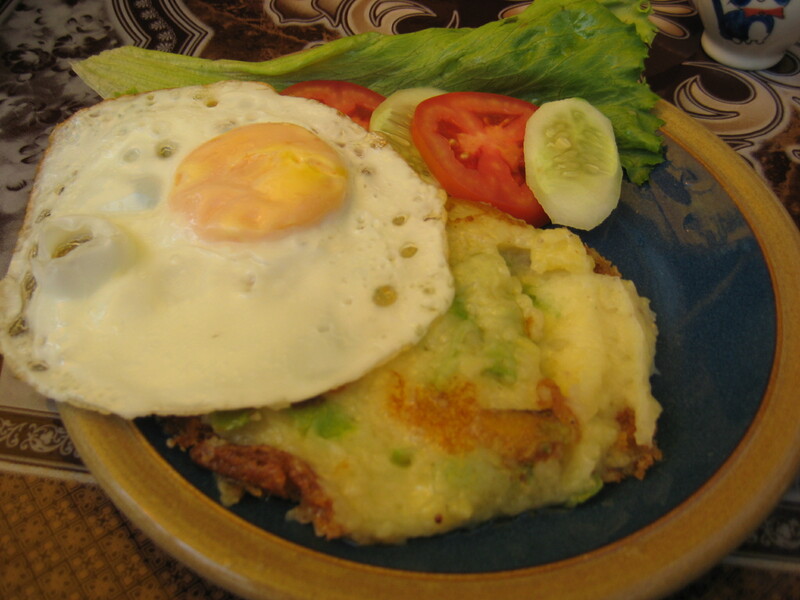 And what is that bubble + squeak underneath? It didn’t look too offensive, so I dug right it, and it was DELICIOUS!! It seemed to be mashed potatoes with green onions, all fried up so it was a little crispy on the outside. Not the healthiest breakfast, but proof positive that it can be well worthwhile to try something out of the ordinary. I love all the new things you’re trying. And I love that I’m learning right along with you! I am having this for dinner tonight. It sounds delicious. Checked the Internet, seems there are differentbways to make it. Yummy.